Important: The purpose of this is to really assess, what they know, what they believe and what they will do. Without user “buy-in” and ongoing commitment, go no further, because it is an absolute waste of time. Maybe you can teach old dogs new tricks but if you try to teach them how to “sign a song” it is not likely they can and find it truly annoying. Social selling is just not selling via social media. As we have integrated CRM and other custom/public tools into our selling processes, social media selling is expanding the use of all technologies to enhance the communications process, reduce sales cycle, reduce order confusion, accelerate customer acceptance throughout the lifecycle, enhance long-term “gain-retain” ratio thereby reduce customer churn, enhance customer experience, increasing product/solution margin, integration of selling technology into products and services and other factors. 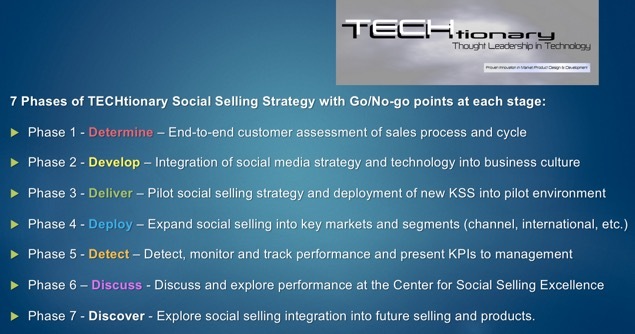 The TECHtionary Social Selling Strategy (TSS) is a professional services engagement to begin the process of engaging with corporate and channel sales (if any) to enhance their ability to use social media selling as part of their sales-support lifecycle. In addition, TECHtionary can optionally be involved in improving sales processes, compensation plan, marketing communications and other aspects of the business. TSS is a multi-phase project with Go/No-go points to limit risk while expediting the process to maximize corporate performance and efficiency. To begin the assessment process TSS will interview key members of client management team in a series of telephone and where possible in-person interviews with selected clients executives including a selection of each person or role in the sales, delivery, support and other business operations. While the specific number of interviews is to be determined, it is recommended that in terms of geographic market and product mix there be both breadth and depth of personnel be included. That is, from new-hires to seasoned executives be included as well as anyone involved in “touch points” throughout the sales, delivery channel, finance and support process be included. Ideally, customers of various sizes are also desirable. Note: These interviews are not questionnaire-style but designed to really understand what people know or not know with the goal of finding out how social media selling can be used or not in their professional efforts. Overview – Interview key members of client management and customer interviews will be based on the key issues on the following pages understanding that not anyone staff person or customer will have answers to these issues. It is the goal to evaluate and determine overall proficiency and knowledge of social media selling processes. During the interviews, here are some but not all of the following areas that will be reviewed with different types of personnel to build an overall organizational assessment. – Management – evaluate current sales practices not just lead-gen – inbound versus outbound building, funnel, data mining and other factors. Gain an understanding of what kind of social media selling is taking place now, if any. Review concepts to guide sales people into social media selling, integration with current selling training and daily practices, evaluation of other factors such as compensation, product mix and other management issues. – Communications Media Channels – what are current product/solution messaging and mediums used for current sales with the goal of understanding the role of sales-marketing interfaces for specific campaigns, events and other sales activities. Specifically, evaluate how social media selling would fit into the organization including support, product and other areas. In other words, are there “black holes” that could impact social media selling to derail the process? – Core Customers – potential, fans, fence-sitters, ignored, end of life – are customers “listening to what you say on social media and are you listening to what customers are saying” – who is the real buyer and who are other key decision-makers? Explore and understand the current sales cycle. – Technology – assessment of current selling (e.g. CRM) and potential social media selling platforms and other tools including apps, smartphone, custom mobile and other devices. – Organization – understand internal ‘sales culture’ and organizational limitations to adapting new ways and tools for social media selling. Explore organizational flexibility for change including sales training, growth and career path. – Marketing – 4 P’s (price, place, promotion, product) are traditional marketing concepts – can social media selling really fit into Avaya’s sales and marketing efforts? Explore current customer “engagement factors” and build a framework assessment for later efforts. After the interviews, we will build organizational and customer personas and map them to a social media selling approach based on sales channel and product/solution. In addition, an evaluation of customer buying cycles, alignments, down to the branch level will be presented. Also, what do they know, think they know, and need to know about social media selling. Deliverable – This is the research and information gathering phase. A verbal online or onsite presentation with the results of the interviews and social media selling readiness will be presented to management. Phase 7 – Discover – Explore social selling integration into future selling and products. Bottom-line – Social selling works and will be the way you sell in the future. Like CRM it may take a while but ultimately will be integrated as a key element in the total selling process. To begin, email cross@cross.com or call 303-594-1694. In the meantime, showup, showoff or shoutout for the Social Selling SympoXpo, click on image for more.